The Banner of Peace is the official flag in use around the world by members of the Planet Art Network and World Thirteen Moon Calendar Change Peace Movement. It is displayed at all events, gatherings, and centers which promote natural time and planetary peace. The Roerich Pact and Banner of Peace was designed by Russian artist and humanitarian, Nicholas Roerich (1874 – 1947) as a response to the destruction of the first world war and the Russian Revolution. It is an international treaty signed by India, the Baltic states, and 22 nations of the Americas including the United States. The Roerich Peace Pact established an international agreement allowing any nation to protect its cultural or artistic heritage with a symbolic banner, the Banner of Peace. Signed in 1935, this treaty is international law today. Just as the Red Cross protects hospitals, the Banner of Peace was implemented to protect culture. The Pact states, “educational, artistic, and scientific institutions… shall be protected and respected by the belligerents … without any discrimination as to the state allegiance of any particular institution or mission… these missions may display a distinctive flag (the Banner of Peace).. which will entitle them to special protection and respect…” Thus any site of cultural activity around the world can fly the Banner of Peace to declare itself neutral, independent of combatant forces, and protected by international treaty. The distinctive Banner is three red circles surrounded by a larger red circle on a white banner. The deep red color symbolizes the color of our one blood, which is the same for all peoples. The top circle represents spirituality and encompasses the truth of all religions, that we can all unite regardless of our distinct beliefs. The two circles on the bottom represent art and science. The circle that surrounds the three spheres represents culture, the unity of art, science, and spirituality. 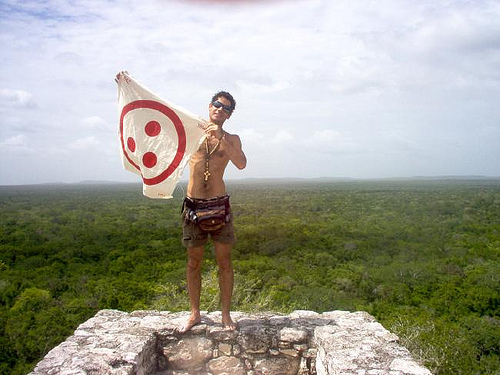 The symbol for the Banner of Peace can be found in many cultures and numerous philosophical systems. It can be found on the coat of arms of the Popes, on Ethiopian and Coptic antiquities, and stone age amulets. It also appears on Tibetan rings, Buddhist banners, the Temple of Heaven in Peking and in the oldest of Indian symbols, the Chintamani, the sign of happiness. 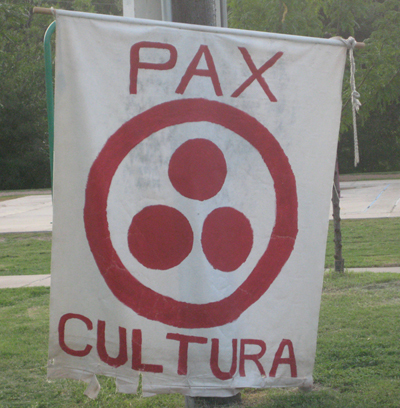 Found in all cultures, the Banner of Peace is the perfect symbol to bring all peoples together in peace. 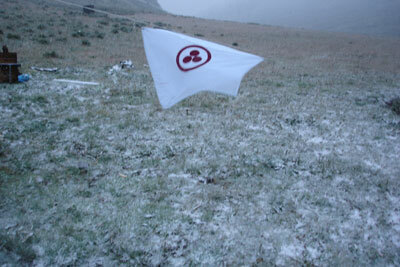 See www.13moon.com or www.roerich.org for more information. Tempera on canvas. 46.5 x 78.5 cm. 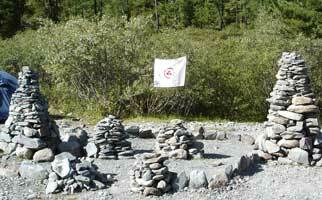 In the sacred Yarlu valley in the Altai, close to mount Belucha, the banner is carved on the rocks. 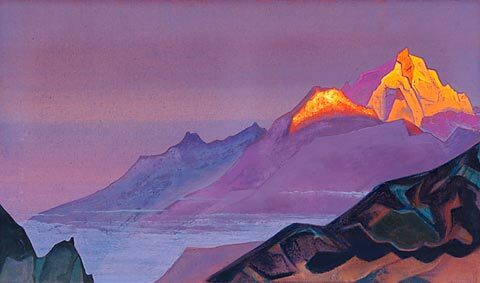 This is where Roerich found the symbol and felt the amazing energy at these places. Bring your flag on all your travels. 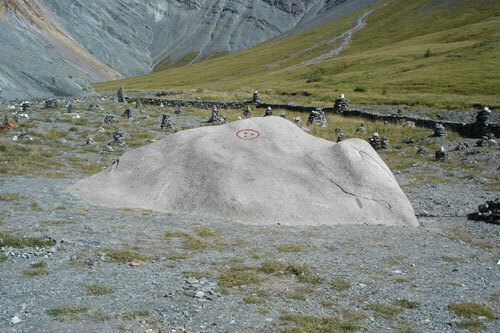 Here you can see it in the Altai, Siberia.